The trees around us have been busy painting their annual masterpiece of autumn hues of yellow, green, orange, and maroon. The breeze picks up as the sun kisses the world goodnight with a glimmer of gold. The night lasts a little longer and the air is cold and crisp. Oh, how I love this season. 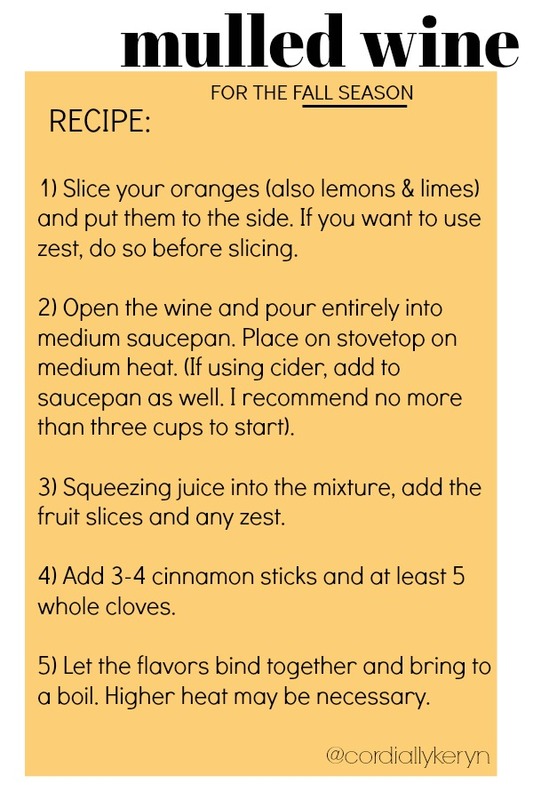 I came across mulled wine about three years ago and I’ve been hooked ever since. My parents came over for dinner Thursday evening and this was the perfect drink to serve as they settled in. It would also be great to serve as an after dinner drink. Mulled wine is a scent that fills your home, it is a warmness that soothes your soul, and it’s a delicious way to “take the edge off” the day as you cozy into the evening. It’s a different way to enjoy a red wine and it’ll make any dinner guest feel like you put in the extra time to make a festive beverage! So, let’s get right to it. I’m not a fan of the recipes you have to scroll through pages to finally get to the facts we all want to know: what do I need and how do I make it?! Below I’ve attached photos that you can use for just that. Hold your finger onto the photo and it will give you the option to save! Save them to your phone and pull up the ingredients when you’re at the grocery store! When you’ve made and enjoyed your mulled wine, post on your Instagram story and tag #cordiallykeryn so I can see how you made your’s and I’ll feature you! 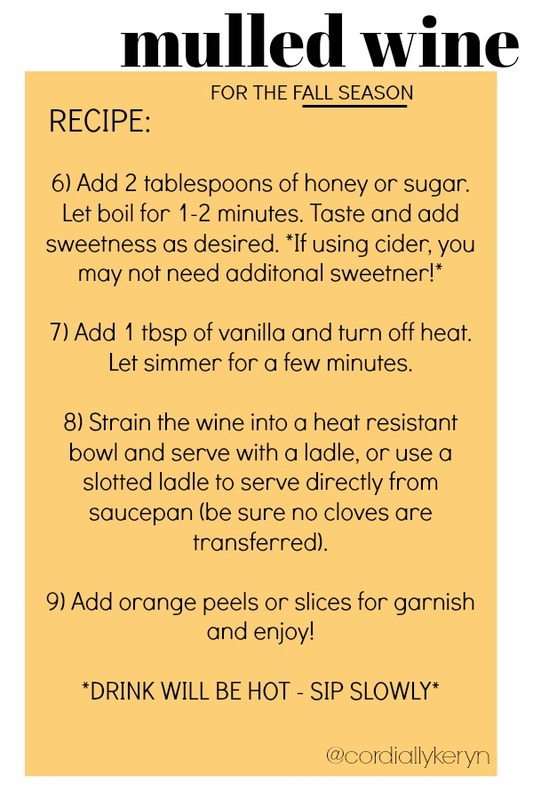 I’m going to make a fresh mulled wine tonight and I’ll be sharing that on my story as well!